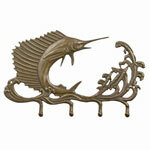 Fish - Marlin Gifts - Click on an item for more details! This beautiful Marlin Table Lamp is made of poly-resin with hand painted finish. This unique artwork will certainly complement and enhance the beauty of your home or office. 30 inches tall.